Guild Hall opened in 1931, as one of the first multidisciplinary centers in the country, with a major celebration that included the inauguration of the Moran Gallery named for painter Thomas Moran, and the Woodhouse Gallery named for founder Mrs. Lorenzo E. Woodhouse. Early exhibitions focused on the artists and history of the region. Among its many firsts, the Museum began exhibiting photography as a fine art in the 1930s, anticipating the medium’s later acceptance into the wider canon of art history. Guild Hall also mounted early exhibitions of Abstract Expressionism—for example, Jackson Pollock had work hanging in the galleries at the moment of his breakthrough magazine spread in August 1949. In 1973, Guild Hall Museum was among the earliest institutions in the United States to receive formal accreditation from the American Alliance of Museums. Of the 35,000 museums nationwide, Guild Hall is still one of approximately 1,000 to hold this distinction. The Museum’s reason for being was prompted by its surrounding artists’ colony. Dating back to the 1870s, esteemed painters such as Winslow Homer and Thomas Moran established studios in East Hampton, followed by many others. After World War II, Surrealist émigrés Salvador Dali and Max Ernst found refuge on the East End. Creative pilgrimage continued with Abstract Expressionist artists Jackson Pollock and Willem de Kooning, Pop artists Roy Lichtenstein and Jim Dine, and Neo-Expressionist artists Eric Fischl, David Salle, and Julian Schnabel. Today, contemporary artists like April Gornik, Barbara Kruger, Richard Prince, Cindy Sherman, and Taryn Simon live in the region and participate in Guild Hall as a communal art space. Guild Hall Museum continues to embrace the influx of artists who are drawn to the region because of its history as a fulcrum of the art world. From this creative confluence, the curatorial staff formulates ongoing exhibitions that contribute significantly to art scholarship. 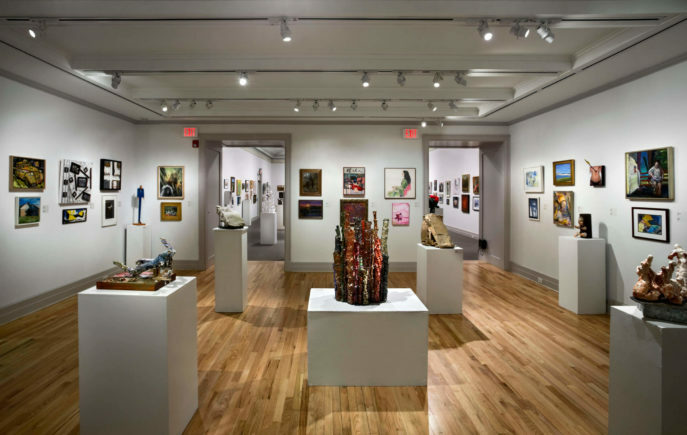 Annually, the Museum mounts eight to ten exhibitions, ranging from the historical to the contemporary, and focusing on artists who have an affiliation with the Hamptons. The Museum’s Permanent Collection houses 2,400 works of art, with an emphasis on the 20th and 21st centuries in all mediums, from painting, sculpture and photography to video, and installation art by artists of the region.